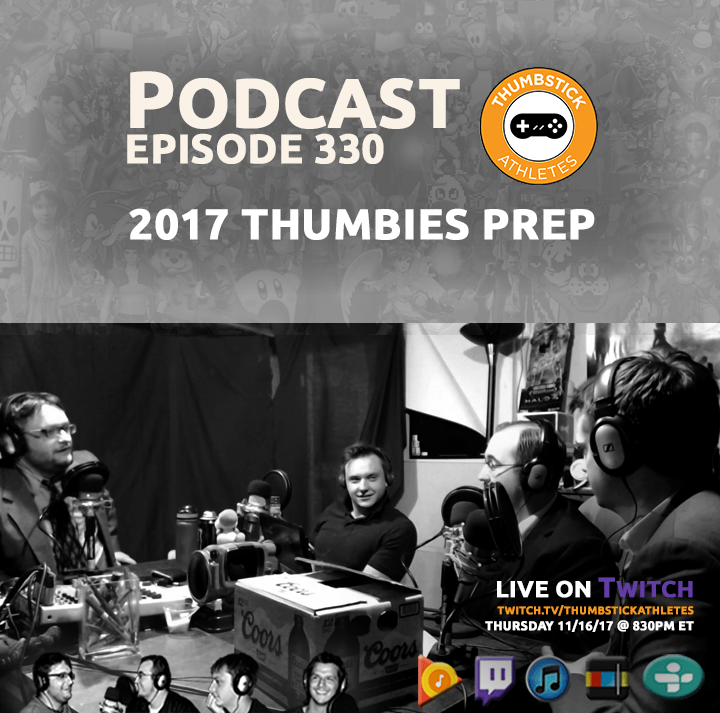 This week we huddle on the Thumbies. For you initiates, that's the only Game Awards show that matters... to us. We'll figure out which categories are staying, which are going, any to add, alter or more clearly define, and maybe even set a date for the big show. The show will be live streamed on Twitch Thursday, November 16th @ 8:30pm ET, with show notes here to follow. Final Fantasy 15's protagonist, Noctis, will be joining the cast of Tekken 7. Here are the Game Awards nominees. Dynasty Warriors 9 get a February 13th release date for North America and Europe. Dan changes his car's oil for the first time. Eric does more baby planning and is elated about the Bill's QB change. Congrats to Idaho Jake, 5 consecutive wins of the game giveaway!